Gal*Gun’s premise is one of the most unique out there, and it’s been praised at turns for its satirical take on eroge games and also considered worthy of a media ban in some countries. The idea behind the game is simple: every girl that you meet is in love with you, but if you don’t fend off your suitors via pheromone shots, you’ll literally be loved to death. 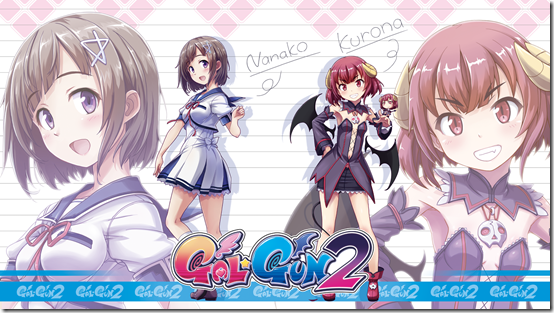 With that same concept being applied in Gal*Gun 2, Inti Creates’ venture onto the Switch, throw in the idea of you having to find your soulmate amongst all this amorous attention and bang. That’s a recipe for hilarity and solid shooting mechanics if I ever saw one, and Gal*Gun might be eccentric but it’s got the latter in spades. It appears that this second official chapter in the franchise also incorporates demon-hunting and daily quests, which will bring a little more narrative structure and involvement than we’re used to seeing but hey, no complaints here. Considering that the Switch is very much Nintendo’s newest console baby, the question on everyone’s minds is probably going to be whether Gal*Gun’s infamous Doki Doki mode is going to return. We know that Nintendo tries very hard to be child-friendly in plenty of aspects, most of all its original IP, so them signing off on the game’s touch mode was pretty tough and go, so to speak. Luckily for us, it’s been confirmed by Inti Creates that Doki Doki mode will be back in full force with Gal*Gun 2, so if anything, it’s shaping up to be a worthy spiritual and mechanical successor to the first title. Those in North America better get their pheromone guns ready as Gal*Gun 2 drops this winter, just in time to add to the Christmas joy. Last I reported on Happy Manager – in September 11’s Catch-up, which you can read here – the PlayStation VR logo had been dropped from all press material involving the apartment management title. That means we all have to manage our building with the world’s most adorable tenants on a boring old flat screen. Well, flat no more: Happy Manager is getting PS VR support! Happy Manager puts the player in the role of an apartment manager. Your three tenants are all young, smart, and attractive girls. Get those thoughts out of your head, you’re in a position of power with them! I know I can’t wait to meet 101’s Himari Takeyama, 204’s Barabara-Kristine Tachibana, and 302’s Shizuka Sakurai in the PlayStation 4-exclusive title. Koei Tecmo, why the not-quite-news on Dynasty Warriors 9? Okay, now THIS trailer is where the real news can be found! There are characters and environments that make me want to crawl into the digital universe, and a brand-new State Combo system that expands attack options available to the player. This system includes Flow Attacks, Reactive Attacks, and Trigger attacks. When it is released, Dynasty Warriors 9 will be available for PC via Steam, PlayStation 4, and Xbox One. It’s not quite Miku, but the next Idolmaster game looks really good! Announced at the TGS 2017 PlayStation Press Conference, The Idolmaster: Stella Stage now has a complete trailer available, so let’s get started! Stella Stage was a legendary stage planned by the 765 Production president and the 961 Production president, but it never happened. The two were just too different. So it’s now up to you, the player, to make Stella Stage a success and lead to legendary idols being created. The 13 idols of 765 Productions have made their unimpressive debut. The protagonist is given the title as their producer, and their/your job won’t be easy! The game essentially allows you to create your own Idol in the image you want, beginning with one of 13 characters. The Idolmaster: Stella Stage will be released in Japan on December 21 – my birthday, how kind of Bandai Namco to consider me!